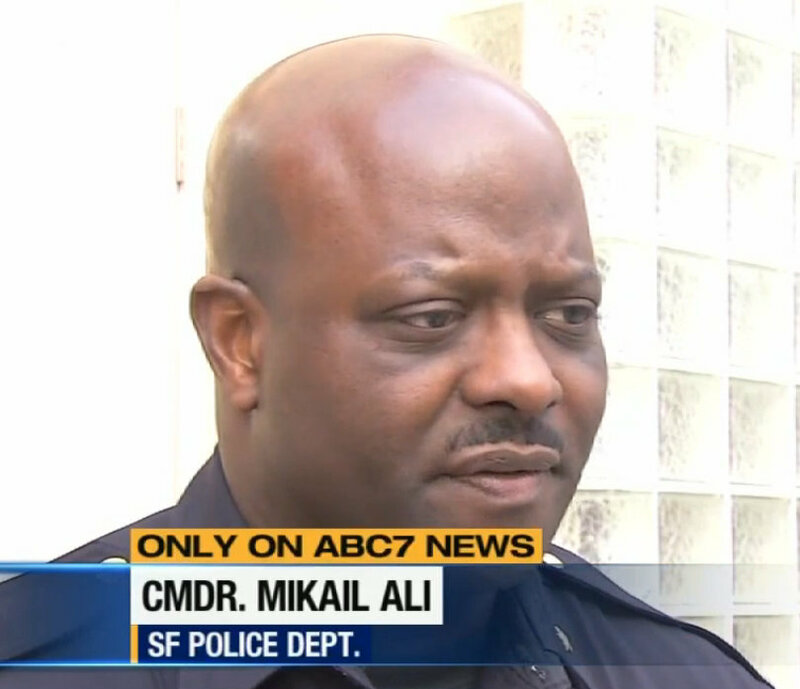 SFPD Traffic Company Commander Mikail Ali offered a particularly bizarre explanation yesterday for why a significant number of pedestrians killed in the city are Asian seniors: They’re recent immigrants who are confused by our traffic patterns, he said. “I’m told that traffic patterns there, they flow differently than the grid type patterns that we have here, and so people may be accustomed to a different type of traffic pattern,” Ali told ABC 7. It’s hard not to cringe when watching law enforcement officials sidestep the clear message the city needs: Drivers need to be more careful to protect the most vulnerable people on the streets — people who aren’t in cars, especially those young and old. SFPD’s data shows that the top factors cited in pedestrian crashes have nothing to do with pedestrian behavior. Sure, everyone can benefit from using some caution, but the dangers facing San Franciscans on the streets are not immigrants unwittingly hurling themselves in front of cars. The fact that many victims killed by drivers are elderly and Asian probably has more to do with them being elderly — it’s well-known that the older we get, the more physically susceptible to injuries and less nimble we become. Consequently, designing cities to favor the movement of cars disproportionately hurts the elderly and minorities who walk. Ali makes it sound like most pedestrian victims just got off a plane after a lifetime on chaotic streets in Asia and were unable to grasp San Francisco’s practice of prioritizing the streets for cruising drivers. Although, 84-year-old Isabell Huie, a longtime Chinatown activist, may have indeed been confused by the traffic pattern she saw when an elderly driver lost control of her car while trying to park, plowing into her and a man, killing Huie. We have yet to hear the SFPD say much about confused elderly drivers, though (these types of crashes happen more often than you might think). We shouldn’t go too hard on Ali. He’s been making the right type of statements recently that other law enforcement officials haven’t. He told the SF Examiner last week that “grossly negligent” drivers will “find themselves in jail.” And in a presentation to the Police Commission yesterday, he made it clear that he’s keenly aware of the impetus to follow the department’s “Focus on the Five” campaign, which targets the five most common violations cited for causing pedestrian crashes (all driving violations) and the five most dangerous intersections in each police district. There’s no way we’re not going to see more tickets. We are. There will be more enforcement, especially at those intersections that have been demonstrating themselves to be more dangerous and where we get more complaints. But on the other side, it’s just the general public. As we get more crowded, we just need to slow down and be less distracted. The 30 seconds that it takes to cross the street can certainly be crossed without being on your cell phone, or looking down. People should never be texting while driving. I’m telling you right now, that’s a super expensive ticket, and there’s going to be a lot of those tickets given, whether they’re Uber or regular drivers. People just need to pay attention when they drive, and if everybody would just slow down. These are promising signs that SFPD’s leadership is starting to get it: as far as enforcement is concerned, the path to safer streets is not wagging fingers at the victims. As Ali noted in his presentation, drivers “have a greater stake” in ensuring everyone’s safety, as they’re the ones piloting multi-ton motor vehicles. We’re pretty much all well aware that drivers are the ones with the power to kill. Education is expensive, time consuming and its results come and go depending on budgets and so forth. It’s a great way of saying ‘we can’t solve this’. SF needs permanent solutions. Build more separate between cars and pedestrians, not invisible barriers like painted lines. More pedestrian zones. More bike only streets and paths. Separate the cars from the peds and bikes like other world class cities have done. For 7000 pedestrians owned the city scape and cars are a new intruder into this space. Quit building parking spaces. Build more livible spaces. Again, the “Drivers need to be more careful” concept is ineffectual. Drivers need to do less driving all together. Get on a bike. Walk. Stop driving. If progress is defined as moving from condescension (ignorant, inattentive pedestrians) to ambiguity (ignorant, inattentive pedestrians coupled with egregiously bad drivers), then yes, the mayor and SFPD brass have made a step forward. I, however, cannot discern from their comments any change in policy or longer term police priorities. It would be nice if we could have more of the SFPD officers actually live in town rather than in far flung suburbs so that they develop a sense of what it means to live in the city rather than the windshield-centric viewpoint too many display. An obvious point has been missed by this article. The reason many pedestrian victims have been Asian is because back in the 1950s the minority and poor areas of the city were deliberately sacrificed for the benefit of wealthy white car commuters from the suburbs, either by building freeways through them, or by converting neighborhood streets to arterials to speed drivers between the freeways and downtown. The fact that this injustice has not been reversed by subsequent city governments shows casual indifference to the residents of those parts of the city. I’m in total agreement. Twenty’s Plenty. Now, can we get it in three part harmony – with feeling – from our Streetsblog brethren and sisteren? This is a campaign we can mount and win. Let’s get going. Indeed. I intended to loosely touch on the the concept by noting how “designing cities to favor the movement of cars disproportionately hurts the elderly and minorities who walk.” Thanks for expanding upon that point. Yes! Yes! Yes! And don’t forget lowering the city’s speed limit, and then enforcing it. If the cell-phone crazed elderly would only look up and stop texting for once..
Don’t forget that we really don’t know exactly how safe/unsafe our streets are, since City Hall has been basing its estimate on only police reports, ignoring accidents recorded at the city’s primary trauma center, SF General Hospital. Until that radically flawed methodology is corrected, we don’t have a reliable data base. jonobate, I think that argument works well for many US cities where there has been “white flight” to the suburbs while the poor and minorities were left downtown. But San Francisco is something of an exception to that rule. The most affluent parts of SF are fairly close to downtown e.g. Telegraph Hill, Nob Hill, Russian Hill, Pacific Heights and so on. While it’s the poor people who live further out – the cheapest parts of the city are to the south and west. Or of course the suburbs, particularly the East Bay. This leads to a paradox in that the wealthy can often walk to work to their downtown offices while the poorer folks who live further out can be more dependent on cars. So you are saying the streets are even less safe than we think? That should clearly be a basis for even more firm action to correct it. Except for the Western Addition and Tenderloin, which contain the new arterials. That won’t fly up on Pac Heights. Clearly because the amount of accidents to date has been underreported, we need to stop all efforts at pedestrian safety until we establish how much worse the problem is than we thought it was! Josh, the limit right now is 25 in most of the city. So I’d guess that drivers might not necessarily object to a general 20mph limit with the important proviso that you mentioned – there must be some (non-freeway) “arterials” where the limit is higher and also where such speeds are usually possible. Could there be the basis of an agreeable tradeoff here? Quiesced streets in the main but with a few important exceptions that are designated vehicular arteries that are purposefully designed for higher traffic speeds and volumes? That ignores parts of SoMa, especially Lapu Lapu, as well as little saigon and the tenderloin, i.e. traditionally asian and black communities with less than 10% car ownership and incredible density but that have to deal with some of san francisco’s worst arterials, highest pedestrian injury corridors, and almost no green space. Telegraph Hill, Russian Hill, and Nob Hill have historically been affluent, but has always had a low to middle income and working class element living in those neighborhoods as well due to the proximity of service jobs in the Northeast quadrant of SF. It’s within the last 10 years that the least affluent have been pushed out to the Western and Southern parts of SF and beyond. Pac Heights has always been affluent. The UC study that found that the city was under-reporting cycling accidents in SF of course didn’t study whether other injury accidents have been under-reported. The city needs to go back and do that study. Agreed? Since SFPD can’t be bothered to enforce traffic laws, what difference would that make? The only thing we might find out is that the statistics are even WORSE than we thought. And we already think the statistics we have are intolerable. There isn’t really a difference between intolerable and intolerable. So you don’t want to know the facts? I don’t want to waste time and money collecting facts which result in the same conclusion we have already made. Rob, you’re correct that the city should study the accident reports. The statistics then will look even worse and hopefully calls for action even louder. For the time being, the city should proceed based on the already grim (for civilized world) statistics. Agreed. The drivers in the downtown area particularly fly up and down Pine & Bush at speeds of 50 and 60 miles an hour some times and I’ve never seen any monitoring, speed control or otherwise. I wouldn’t say “purposefully designed” for higher vehicle speeds, as that would be moving backward on pedestrian safety. I’m just saying that roads like Sunset Boulevard, 19th Ave, Junipero Serra, and perhaps Alemany and similar roads could be left as they are. I would advocate for the entire northeast section of the city to be a 20 MPH zone, say north of Bernal Heights and East of Twin Peaks. Actually, the stats now aren’t that bad for pedestrian fatalities. The recent deaths didn’t make last year a particularly bad one in historical context. But the city in its Collision Reports takes a close look at streets where the most accidents happen to see what can be done to make them safer. Hence, it’s important to first get the relevant data before that can be done. I think Rob is saying, let’s be careful here. It might be that all these pedestrians are dying through their own faults, (such as being elderly or Asian). If that turns out to to be the case, which SF General’s ER can confirm, we can avoid unnecessarily inconveniencing drivers by taking drastic and unnecessary steps like enforcing speed limits. Sure, I want to know the facts, but an incomplete dataset is not an excuse for inaction. Not even you are claiming that the people we know were injured or killed were not actually injured or killed; your claim is that there might be more we don’t know about. Fine, but knowing that even more injuries took place will not alter the action we should be taking, it will only strengthen the case for taking action. Let’s focus on fatalities for a moment – I think we can agree it’s very unlikely there are fatal traffic accidents that are not included in SFPD statistics. According to their statistics, 14 of the 21 pedestrian fatalities in 2013 were clearly due to driver violation of law. 9 of those were “Driver’s failure to yield to pedestrian right of way at crosswalk”. That’s enough evidence that driver compliance with the pedestrian right of way in crosswalks needs to be better enforced. There are indeed affluent neighborhoods which are close to downtown SF, but those are not the neighborhoods through which freeways and high speed arterial roads were built. The neighborhoods with the freeways and arterials are Soma, Tenderloin, Western Addition, and it’s here that the majority of pedestrian injuries and fatalities are concentrated. I think it’s more accurate to say that San Francisco was less affected by “white flight” than other American cities, not that it’s an exception to the trend. I don’t know whether I can agree with that assessment about Asian immigrants. I can tell you that car drivers in many parts of Asia expect pedestrians to yield the right of way for drivers (except in busy pedestrian zones) or you get honked. The only thing that I can see as a major difference is that at least in Hong Kong, the green light for pedestrian is a true green with no cars allowed to turn onto the crosswalk (in SF you need to expect oncoming car traffic even if you have a walk sign, less of a problem in other cities where they have dedicated left turn lanes and signal, but may still have right turn traffic). In Hong Kong, many wide crossings have two separate signals with each covering half of the crossing, so that one side of the road the pedestrians will get true green and the other side will have red and cars can continue. Yes. A friend of mine visited China recently and told me that at least in China drivers have the right of way over pedestrians. So if Ali’s logic were true you would think immigrants from China would be more cautious than those raised in the US and not less. “Better enforced”? Okay, no disagreement on that. But the point of the UC cycling accident study is that the city has been relying on police reports alone for their accident and fatality numbers. That is, it is very likely that even fatalities have been under-reported. Come back when you’ve found evidence of a traffic related fatality that was not reported by SFPD; then we’ll talk. The burden of proof isn’t on me. The UC study showed that the city was relying only on police reports to count cycling injury accidents. Hence, it’s not unreasonable to assume that it made similar errors counting other accidents. The city needs to go back and correlate the police reports with SF General’s records. The city may be doing that now, which is why its Collision Report is six months overdue. @Rob Anderson – Stats showing the highest pedestrian fatality rate in the West “aren’t that bad?” Compared to what? Compared to previous years in SF. Look at page 19 of the MTA’s Collision Report. But as we discussed earlier, the UC study shows that the city has been under-counting cycling accidents in the city, so it might be also under-counting pedestrian and other accidents. Presumably the city is now doing a thorough re-examination of how it counts traffic accidents to provide us with more accurate numbers. That’s just the new Bicycle Coalition slogan, Murph. You’re a good, party line guy.